Sometimes the aim of ab exercises isn’t about a well defined six-pack. A six-pack might look nice (on the occasion you get to show it), but a well developed core will serve you all day, every day. Your core is the basis of your posture, staying steady on your feet and twisting and turning. Working your core from every angle, switching routines and watching your diet will net you a strong core and flat, tight abs. These 10 yoga for abs exercises will develop your core strength and stability and help you to those toned abs. All the exercises presented here come from our comprehensive abs guide published in two parts: Part 1 and Part 2. We’ll provide a brief intro, however for the instructions on how to perform them, you’ll to visit the links to their original article, at the end of each exercise. Indian push-ups are one of the best bodyweight exercises around. They engage your chest, shoulders, arms and core just like a regular push up. However, they also require you to be aware of your body position at all times. They add a bit of intensity to your workout and employ the use of a few extra muscle groups. This results in more calories burned, and a more complete workout. Instructions: Part 1, Exercise #26. The Bridge Pose is a very versatile backbend that can be done in a variety of ways. There are slight variations depending on what is your goal and on your routine. Bridge Pose opens the chest and shoulders. It stretches your back and spine, the back of the neck, the thighs, and the hip flexors. Very useful exercise somewhere in the start of your routine. Instructions: Part 1, Exercise #27. 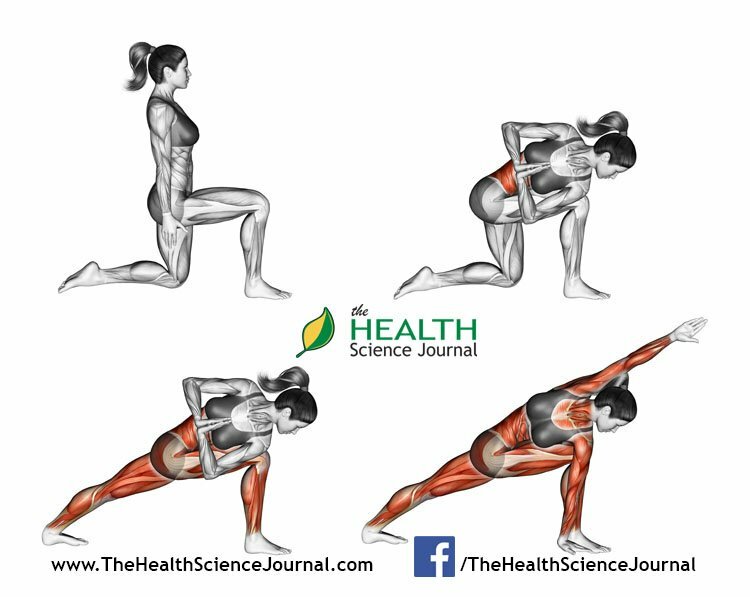 While at first Crow/Crane pose might seem a strange choice for an ab exercise, arm balances are mostly about core strength and flexibility. Your core helps you locate your centre of gravity and distributes the load evenly. 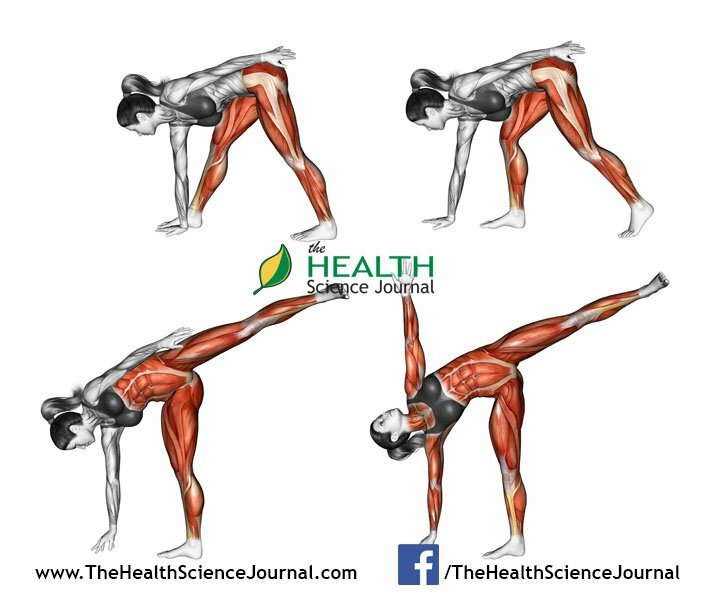 The muscles of the core are the one supporting your flight once in the air. The muscles at work here are the rectus abdominis, the pelvic floor, the obliques, the transverse abdominis, the psoas, and some spine supporting muscles. In fact, once can claim that core strength and stability is the key to most balancing poses in yoga. Instructions: Part 1, Exercise #29. Double Leg Raise is an excellent exercise for stretching all the legs muscles at the start of your routine. You’ll stretch your ankles, calves, hamstrings, knees and thighs. However, this pose also works out your core and front abs, hips, back and neck. Instructions: Part 1, Exercise #30. Fish Pose stretches your upper body, particularly the throat, chest, abdomen, hip flexors, and the intercostals. 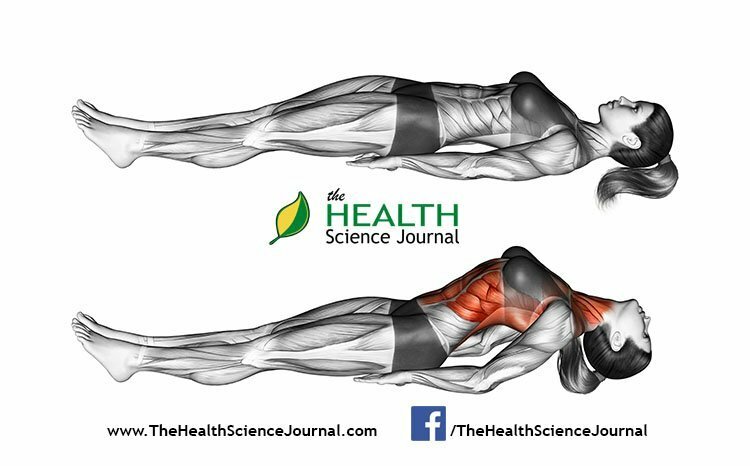 It strengthens your core and neck and as a result improves spinal flexibility and posture. 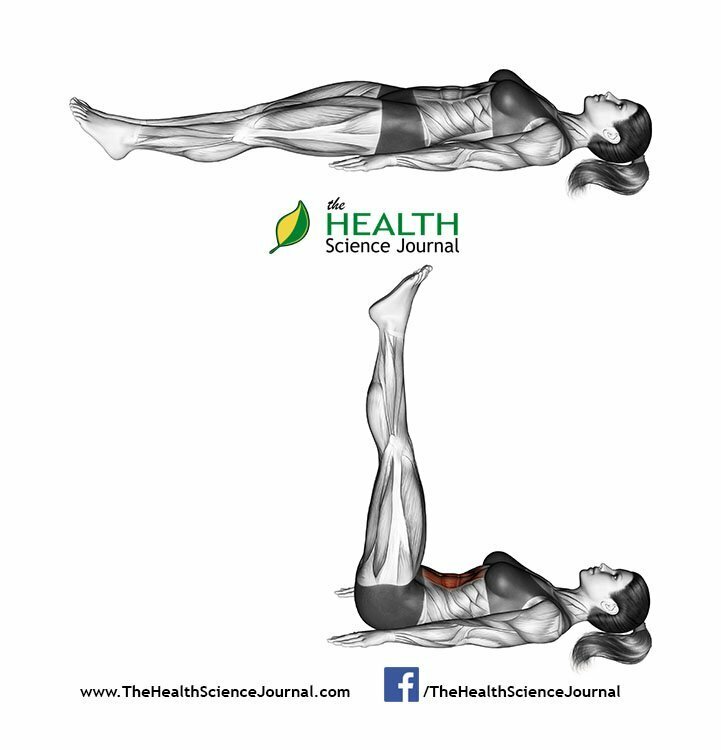 By stimulating the abdominals, it can also help with constipation and menstrual pain relief. Instructions: Part 1, Exercise #31. Revolved Side Angle pose stretches and strengthens the entire body, including the thighs, knees, ankles, calves, groins, chest, core muscles and shoulders. It builds strength in the legs, particularly the quadriceps and ankles. It also stimulates the abdominal organs, improving digestion and metabolism. Instructions: Part 2, Exercise #63. Half Moon pose requires lots of stability. You need to engage the transverse abdominis (the deeper ab muscles) and your core to make the pose more stable. By engaging and squeezing the oblique muscles you help yourself maintain the balance. Instructions: Part 2, Exercise #62. 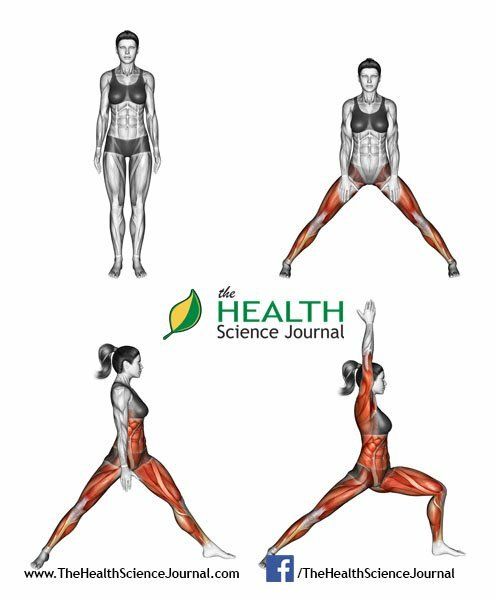 Regular practice of the Warrior Pose increases flexibility in the hips, strengthens and tones the legs, front abs and obliques. There is a twist for the spine in this pose, while you are also opening your shoulders and sides. Instructions: Part 2, Exercise #59. Downward Facing Dog deeply stretches your hamstrings, shoulders, calves, hands and spine while building strength in your core, arms, shoulders and legs. Including this pose in your routine can improve digestion, relieve back pain, and even help prevent osteoporosis. Instructions: Part 2, Exercise #60. Cat-Cow pose is a great stretch that brings flexibility to the spine and can help with back pain. It stretches your back, neck, abs and glutes and gently stimulates and strengthens the abdominal organs. Coordinating your breading with this movement can also relieve stress and relax you. The cat-cow movement also helps with developing postural awareness and balance. It brings the spine into correct alignment, adds flexibility to your pelvis movement and can help with lower back discomfort. Instructions: Part 1, Exercise #28.